Summer vacation provides time for your child to relax and have some fun. However, it’s important to help make sure what they learned over the previous year isn’t forgotten. Reviewing information from the previous school year can help prevent learning loss and keep them up to date on information that they should know for next year. Talking to your child’s teacher may be helpful in deciding which materials to review over the summer. They have been working with your child in the classroom for the last year and will have suggestions reading, projects and more. This will help ensure your child had a good foundation going into the new school year. Try finding some workbooks, quizzes, flash cards and practice problems to help your child review. These can be quicker activities you do in between more fun projects. You can also take one of your child’s past assignments or projects and discuss what they learned. Looking back at their school materials for the year will help remind them of all they have learned and accomplished. Reading is always a good way to exercise the mind and practice skills your child gained from the previous school year. Have your child set aside some time each day for reading a book they find interesting. This could be for 15-30 minutes depending on their age and abilities. Many local libraries have summer reading incentive programs for children to earn prizes. There are also national and regional programs that may interest your child. To find a list of them, click here. If your little one is too young to read, make some time to read aloud to them instead. This will help build their language skills and possibly a lifetime love for reading. The best way to encourage your child’s interest in subjects they learned in school is too help them find ways to continue exploring these topics. For example, if your child began learning a musical instrument, have them review the music they already know and also have them practice a new piece. If your child took an interest in learning about how plants grow, they could plant flowers or vegetables themselves and take care of them over the summer. Summer does not mean learning stops, so be sure to learn and discover new things every day. Want more information on children’s development activities and safety? Looking for fun activities that promote learning without using screens? These 4 ideas might help. 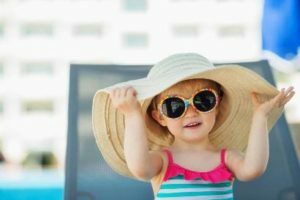 Make sure you are keeping your family safe with these tips on sun safety. Previous Previous post: What are Augmentative and Alternative Communication?